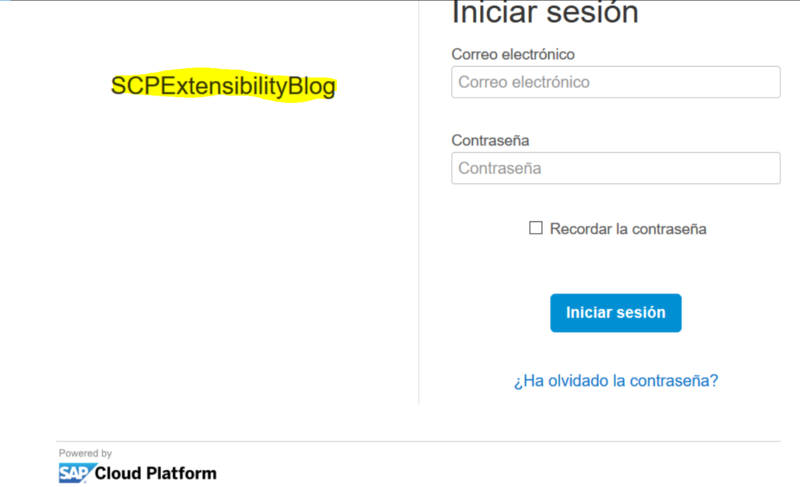 In my previous Blog I took you through the Key-User In-App Extensibility concept and functionalities where the extension is implemented in the same system by users with no deep technical knowledge. In this third Blog I’m going to share with you how Side-by-Side extensibility works and enables external content deployed in SAP Cloud Platform (SCP) to be integrated within your S/4HANA Cloud system. SAP Cloud Platform is an open platform as a service (SaaS) which provides customers and partners with in-memory capabilities, core platform services, and unique business services for building and extending personalized, collaborative, mobile-enabled cloud applications. Note: The same Side-by-Side Extensibility approach is applied to integrate other SAP Cloud Solutions like SAP Analytics Cloud, SAP CP Integration Services and SAP CP Workflow Services. Tip: In S/4HANA On-premise, you can replicate HANA Views from your system in order to be used as a Data Model in SCP. AS of S/4HANA Cloud 1711, SAP Best Practices includes a new scope item (1RW) for Side-by-Side Extensibility. I highly recommend that you take a look at this document which explains in a detailed step-by-step approach, how to create your first application on the SCP and integrate it with your S/4HANA Cloud. 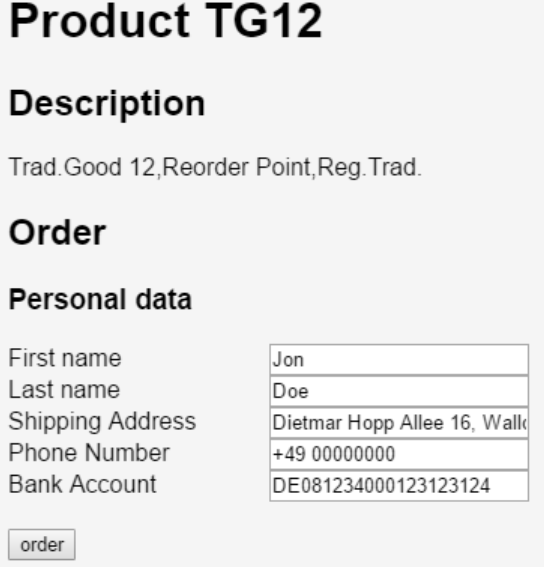 External Product Ordering App: a small Webshop App that reads data from and writes data back to your S/4HANA Cloud system. It allows you to sell your portfolio products to external users in a simple approach. 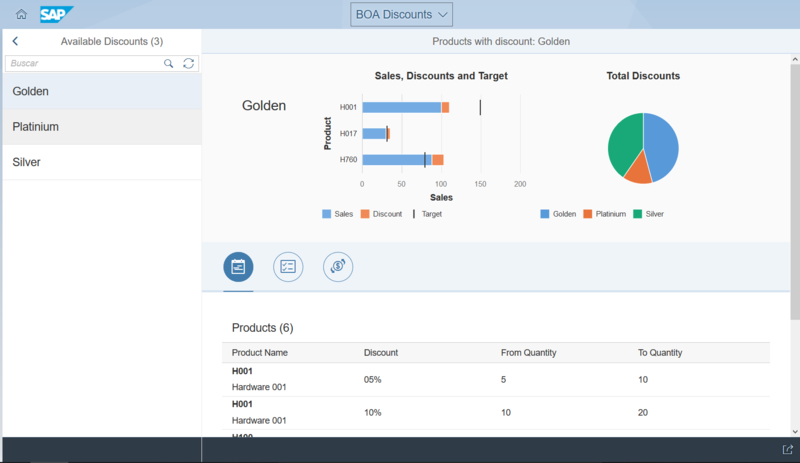 The app reads the available Products from your S/4HANA system. Internal Sales Geo Report App: Based on the previous App, this App allows your internal users to analyse the overall net amount of sales per month. A geographical map shows where a specific sales order has been placed. Note: These apps (downloadable from GitHub) are developed in JAVA. You would need to install JDK 8, Maven 3.0 and Git Command Line Interface. 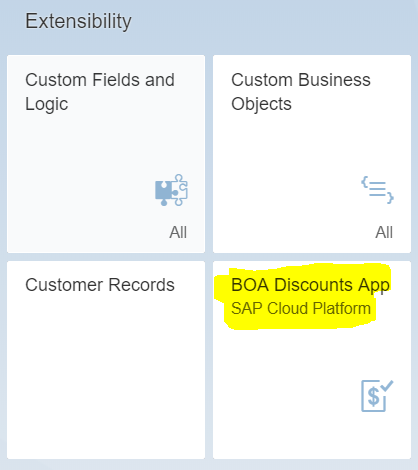 In my previous Blog, a custom Business Object (BOA_DISCOUNTS) was created in our S/4HANA Cloud system, and now it’s time to build an application in SCP which will consume the corresponding CDS View automatically generated after you published BOA_DISCOUNTS. Tip: When you publish Custom Business Objects, the CDS View corresponding to the hierarchy and Custom Code List you defined are available in Custom CDS Views app. Tip: The Standard Communication Scenarios correspond to the S/4HANA Cloud APIs. The full API list is available on SAP API Hub. Depending on your license some of them would not be available within you S/4HANA Cloud system. Note: In the scope Item 1RW, 2 Standards API’s have been used, in addition to a Custom Communication Scenario. Tip: The Communication Landscape app gives you an overview of the connected systems to your S/4HANA Cloud. In order to build an App in SAP Cloud Platform, accessible from your S/4HANA Cloud Launchpad and able to consume the above CDS View which is external content, you need to configure a mutual Trust between SCP and S/4HANA Cloud. Tip: In real scenarios you need to subscribe to SCP. For testing purposes, a Trial Account is enough to build your demo Apps. Tip: Make sure that the Idp you have uploaded is set as Default. This will allow WebIDE to be integrated with your S/4HANA Cloud system. Tip: Now that the Trust is configured between SCP and S/4HANA Cloud you can configure the standard Communication Scenario SAP_COM_0013 for WebIDE Integration with S/4HANA Cloud. An app will be available in your Fiori Launchpad and you can access WebIDE without authentication. Before you start developing your App, you need to setup a destination to your S/4HANA Cloud. This will be used to consume the Custom CDS View. From your SCP account, navigate to Services and go to SAP WebIDE. Once WebIDE is loaded you can use an SAP Fiori Master-Detail Application template where you can use the destination you configured before and choose your Custom CDS View you already built in your S/4HANA. It’s in your hands to develop more sophisticated Apps with Analytics, Maps and more interaction. You might also need to combine several API’s and cross the data you retrieve in order to build suitable data models. As you can see, the Side-by-Side Extensibility allows you to build external apps in the SAP Cloud Platform to read from or post data to your S/4HANA Cloud. The apps are integrated within your system and can consume both standard Communication Scenarios and custom ones based on your Custom Business Objects. SAP API Hub lists all the artifacts you can use to interact with your S/4HANA Cloud. I hope you have enjoyed this 3 Blog series around S/4HANA Cloud Initial System Setup and Extensibility. Looking forward to publishing new Blogs on other topics! Very clear explanation indeed. Great job! Thanks for a very good explanation . I am facing this below error after clicking on the submit button in the first app any pointers how can i trouble shot ? Well explained in simple language. The scope items URL, https://rapid.sap.com/bp/#/browse/scopeitems/1RW doesn’t work for me.